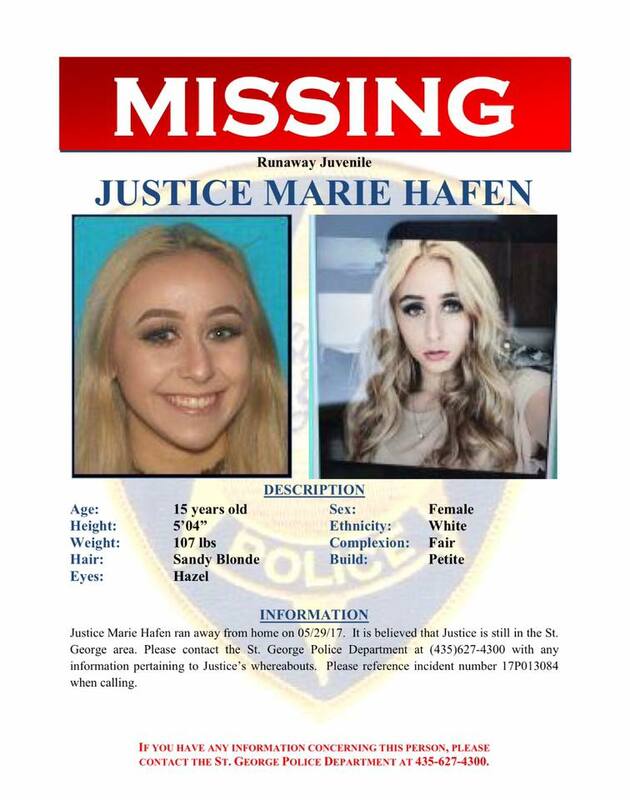 UPDATE: 7:45 a.m. Wednesday — The St. George Police Department reported that Justice Marie Hafen has been located and is now home safe. No other details about the teen’s whereabouts were released. ST. GEORGE – Police are asking for the public’s help in locating a St. George teen suspected of having run away. Justice Marie Hafen, is reported to have run away from home Monday and is believed to still be in the St. George area, according to the St. George Police. Anyone with information concerning Hafen’s whereabouts is asked to call the St. George Department at 435-627-4300, and to reference incident number 17P013084 when calling.